Not even a tropical storm could stop a group of veterans from tarpon fishing in Boca Grande Pass this week. Visiting the island from all over the country, a group of six men built new friendships while sharing experiences on the island together. Pine Island Charter Boat Captain Mark Lee is involved with an organization called Special Operations Wounded Warriors (SOWW). An Army veteran himself, he has experienced some dark days and realizes the importance of finding inner peace and tranquility. Lee spearheaded the project by contacting John Corcoran at Boca Grande Vacations. Together, they began to organize a trip for the veterans to come and spend a week tarpon fishing and exploring Boca Grande. Corcoran coordinated two reduced cost units and one boat slip at Boca Grande North condos for the group to use on the trip. And the links continued to connect to make this project not only enjoyable for the troops, but also therapeutic as well. Lee is an acquaintance of Bobby Dove, a veteran who served in Afghanistan and is also a spokesperson for The Elk Institute for Psychological Health and Performance, which provides psychological treatment and consultation to service members, civilians and veterans at no cost. Dr. Carrie Elk, founder of The Elk Institute, started the nonprofit 501(c) 3 organization in January, 2014. 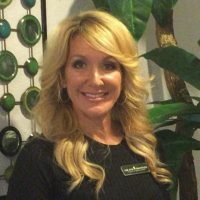 She has worked in the mental health field for more than 20 years. “I was asked to speak at a military base about the effects of Post Traumatic Stress Disorder (PTSD), and I did a brief presentation for about an hour. I left my contact information, and within an hour my phone was buzzing with texts and phone calls,” Elk said. It was then she realized that a lot of service members were not comfortable using traditional base mental health, or they weren’t satisfied with the services available. She wanted to help as many people as possible, but she didn’t feel comfortable charging them for her services. So she ended up not charging the veterans for her services, but she soon realized she was running a private practice filled with nonpaying patients. The end result was The Elk Institute. Individuals and businesses can donate to the organization so service members are able to get their PTSD treatment for free. “Last year, 97 percent of the donations to the Institute went toward direct treatment and education,” Elk said. The institute is based in Tampa, but Dr. Elk travels nationwide for service members who request sessions. 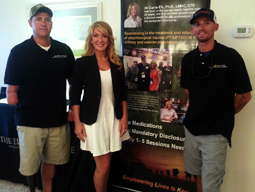 Dove met Dr. Elk at a veteran’s retreat in 2015. “I was so impressed by how compassionate, focused and result-oriented she was, I asked if I could help with her organization,” he said. Besides currently serving as a spokesperson, Dove absorbs many of the administrative tasks, while also helping with fundraising and coordinating events. “Bobby is so invaluable, because I treat a community that I am not a part of, and he provides fellowship and networking with the troops to bridge that gap so they don’t feel isolated when attending a therapeutic event. These recreational programs are so important to get the guys together, and I think they feel more like themselves again,” Elk said. Elk was contacted by “Air Compassion for Veterans,” a program funded through American Airlines that flies veterans for free. They arranged for the troops to fly to Boca Grande this week. Elk said the most effective modern treatment is to schedule outings like this where the vets can enjoy some activities in a relaxing atmosphere and then choose if and when they want to participate in therapy on their own schedule. She spent an average of 10 to 12 hours every day in Boca Grande most of the days the service members were here. The group arrived on the island on Sunday, June 5. Their fishing plans were washed out on Monday due to Tropical Storm Colin. But by Tuesday afternoon, they boarded a vessel with Captain Mark Lee and headed out toward some challenging water in the Pass. “We caught a few small ones, but we had to cut the trip short due to rain,” Lee said. The group would like to thank the following local businesses for providing complimentary and discounted meals and services: The Loose Caboose, Eagle Grille and Miller’s Dockside at Boca Grande Marina and Courtyard Hair. Lee said it took nearly a year to put the entire project together. Dove stressed the need for continued support for organizations that raise funds for PTSD awareness. “We need help to be able to set up more events like these, and we are in dire need of sponsors and supporters,” Dove said. Elk added that corporate sponsorships are always welcome. Anyone who makes a donation will have the right to speak with a service member to see exactly how much the program has changed his or her life. Dr. Elk is also available to come out to your business and give a brief presentation on the impact of your donation. Supporters are needed for future events. For more information, visit ElkInstitute.org or go to sowwcharity.com. Support a veteran's treatment with your tax deductible donation today!